Morning Glories: Charlie turns 3! This is a little late and there's more to come, but better late than never. 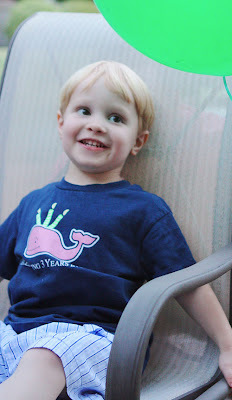 . .
And just like that he turns 3! Happy 3rd Birthday sweet Charlie! You have truly grown up this year. Last year at this time, you weren't saying much. It was difficult for you to communicate. But wow! Look at what a year has done for you! You are so independent! We hear "No, I can do it by myself" all the time! You love to dress yourself, open things, put odds and ends together, help make breakfast, lunch and dinner. You are quite the little chef in the making! You are also often found in big brother's footsteps. Whatever he wants to do, you want to do! I'm struggling to let my little newly turned 3 year old like Spiderman---it seems too old for you. Luke didn't even know who Spiderman was at 3. Guess that's part of being a little brother. You have become quite the artist and really like Mommy and Charlie craft time. I do too! You still amaze us with your athletic ability and we can't wait to see what sport(s) grabs your interest soon. You are incredibly thankful. It is precious to your Daddy and me how genuine your thank you's are. You thank us for getting yogurt from the grocery store, because it's one of the favorite parts of your meals. You thank us for little happies, for pushing you on the swing, for putting socks on you at bedtime, for so many things, and you are truly genuine! Charlie, you are known for your little shy grin and squint/wink you do, so cute, but you have become quite the social butterfly too--saying hello to everyone you meet and telling them your biggest or current passions! It is adorable to see. The age of 2 was delightful! I loved it in so many ways. Your hugs and kisses and sweet high pitched "Good night! I wuv you!" melt me! I could go on and on Chuckles. We hope you know that your Daddy and I love you with all of our hearts. We think it is awesome to see how the Lord placed you as our 2nd boy, so special and unique. We can't wait to see how you grow this next year! We pray that as you start your 4th year of life, it is full of even more love and joy than the years before! Mommy and Daddy are beyond thankful for your precious life! We love you. Happy Birthday!! !